Price action means tracking market behavior and evaluating market information. During this trading approach, traders usually do not use indicators. In the previous article on technical analysis, we have divided it into technical indicators and price action, we will now continue with a detailed explanation of the price action trading style. I remember all the debates and forums where trading strategies were discussed from morning to evening. Many people now respond to the question about their trading style quite briefly. I belong to those who trade price action. But what should think a beginning trader who just knows that it is a chart following? candle patterns “candlestick patterns” – pinbar, engulfing, morning star, evening star, hammer, doji and many others. Quite often, if you look for other candle patterns on the internet, you will find them under name “Japanese candlestick patterns” because all these pinbars, doji and other candle formations are attributed to the Japanese. Candle patterns are usually made by one candle, but for some patterns, there can be three candles. Opposite of this are so-called chart patterns or market formations that are made of more candles. You have certainly heard of head and shoulders, double bottom and double top, triangles, flag, roll reversal and other formations. The main difference between candle patterns and market formations is the number of candles. You are surely thinking about pinbar. A candle with a long knot and a small body, with a long tail indicating panic in the market. There are many other such formations. Below you will find a link where you can get more info information. The biggest problem in trading candle formations is that people absolutely do not take into account the area where the candles are located, see the situation below. This is the most typical situation. (it is not important to discuss here whether it’s a pinbar, a hammer, or just a candle with a long shadow and a small body) People have a tendency to trade pinbar in areas where they think a trend can turn. Most often it is after a long trend, which is beginning to have declining number of people willing to buy and the market is beginning to form these beautiful candles. As you can see, the market is in a decent upturn and the suddenly formed formation begins to indicate weakening number of buyers which is confirmed by candles with a long shadow. That looks as a clear short. And the most common scenario is coming. 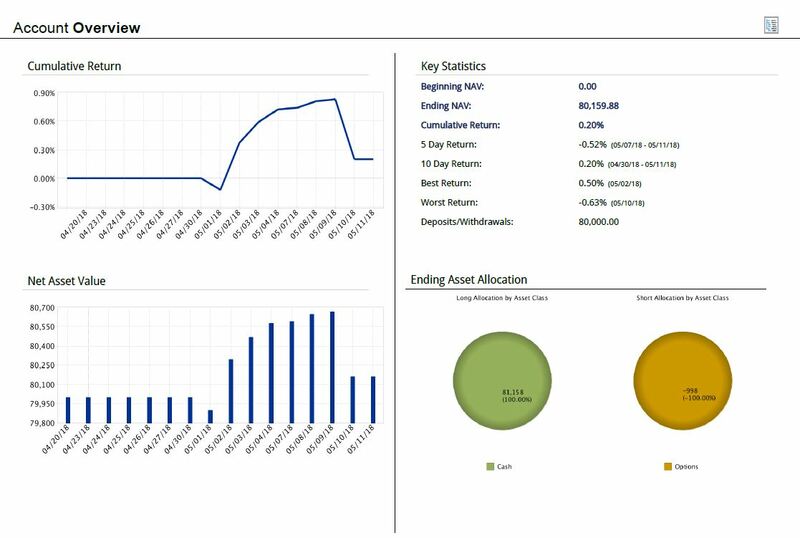 The market continues to grow, although it seems at least the correction must come. The market has grown so long! But to avoid just saying bad things about pinbar, there are situations, especially on the higher timeframe, when it works perfectly. In addition, I recommend considering the area where the formation is located when trading pinbar and other candle formations. If the market is falling or growing in a good angle as it is in our case, speculating that one pinbar turns the entire market is like catching a falling knife with bare hands. Even if there would be fife pinbars, it is not enough. As I wrote at the beginning, price action trading is about bringing pieces into a coherent and clearer picture that gives us a wider overview of the market. It’s very short-sighted to trade pinbar just because it has occurred. Both the candle and the market formation can follow trend, be against trends or indicating increasing momentum. It depends on where the market is and how you look at the market. Someone can see a finishing uptrend and looking for going short, someone see only a small correction and enters to another long position. 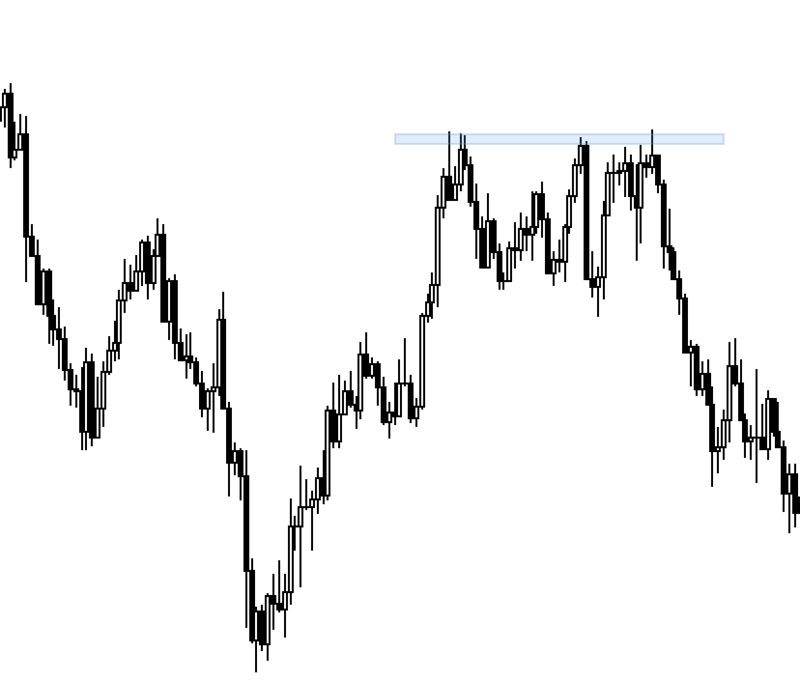 Even more popular price action trading method is market formation. This is the gathering of more candles; the whole formation can be formed by up to several tens of candles. If you trade on a daily chart, the formation can also be formed for months. Then it is more valid compared to one that is created on one-minute chart. Among the most popular market formations are clearly break outs, which are coming from penetration of S / R levels or trend lines. Very common situation is following. It happens that the “funnel” is constantly shrinking, candles in the marked areas of the trend lines make smaller and smaller swings until the upper and lower trend lines intersect. 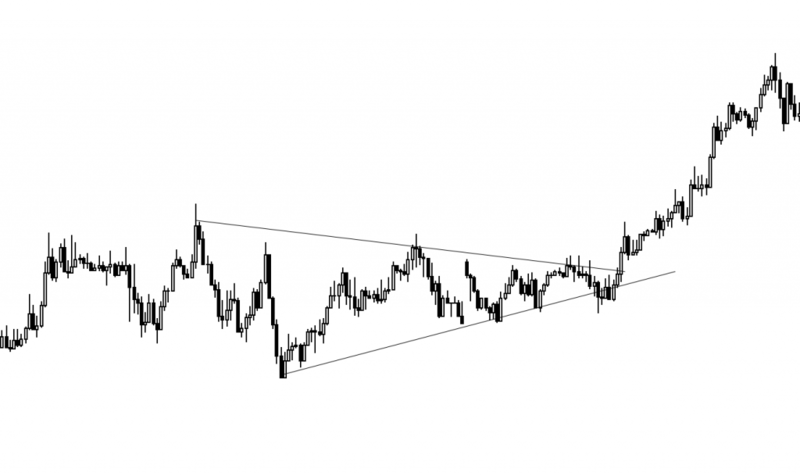 In this area the momentum increases, and the upper or lower line of the triangle are penetrated and break-out occurs. Fuel is a momentum, and therefore when the penetration occurs, the candle tends to be longer (in this case full of buyers). Break out can take many forms, this is just one of them. 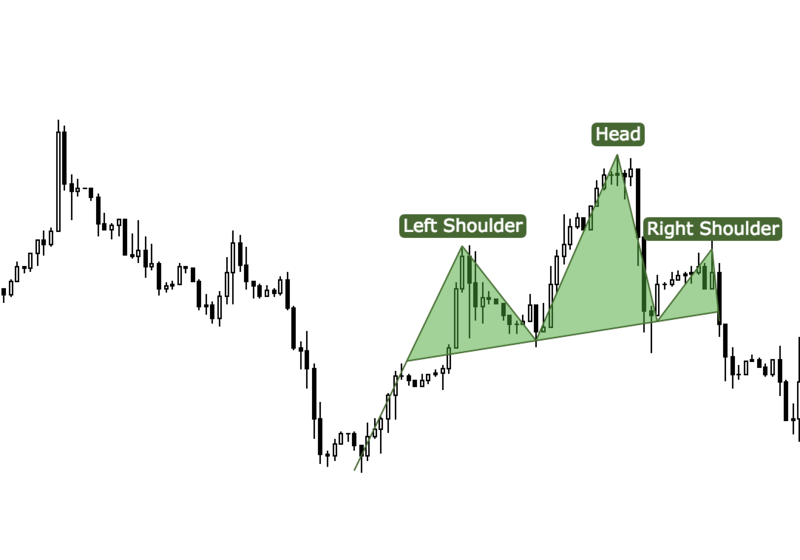 Another popular pattern is “head and shoulders”. Two arms and a head are the basis – if the right arm is properly extended, the signal is acknowledged. Traders usually enter their right shoulders as soon as the price crosses a trendline linking both arms. There are many formations are the same for both downtrend and uptrend. In the future, we are planning to have a large database, where there will be both market and candle formations, and all the terms you can meet in trading. When trading price action patterns, try to trade at support and resistance levels, whether reflecting S / R levels, penetrating them, or on the contrary, deflecting from S / R levels. These levels work perfectly from the historical point of view – when the price approaches a price level in which significant situations occurred in the past, and the S / R level served as support, then resistance, or switched it several times, or only represented support or resistance. By drawing these lines into the market, and trading price action patterns at these levels, you are more likely to have a successful trade. Exactly this may be your edge. What I mean? The market has responded to this level several times. Personally, I trade a style based on similar market logic and it makes sense to me. Do not step into the trade as soon as you see the pinbar. No matter how tempting, it can bring you a stop loss. Try to compose pieces of information together. 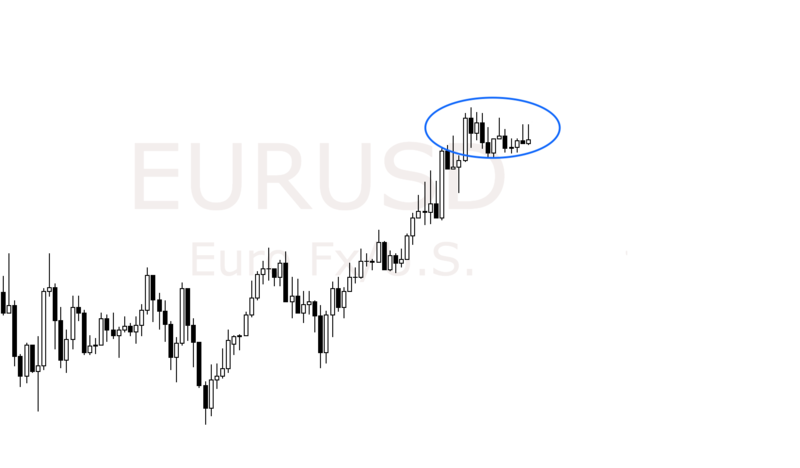 Do you see a beautiful formation at a significant price level that offers entry with a small stop loss in the logical zone and a great potential for higher profits? These are the situations that are worth waiting for. Higher timeframe formation has more validity and strength than the one minute chart.